"The first batch of 12,000 switches will be transparent housing. The batch afterwards will be cyan stem (Signature Plastics BEY) with a translucent black housing. The stem of HP is longer than the stem of KBDfans T1, so the bottom out sound differs slightly." Holy Pandas are pretty much always gonna be what any new tactile switch is compared against nowadays. Honestly though I think there is room in the market for this switch, especially at the $0.55 per switch price. 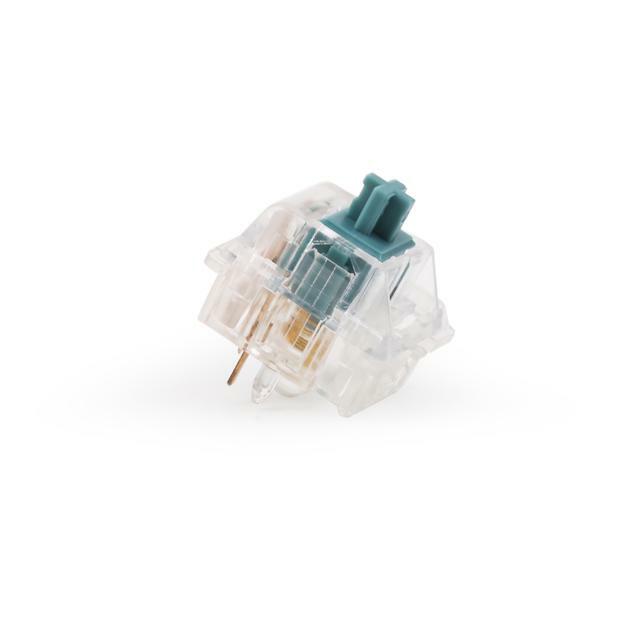 Even with the flood of new switches aiming to fill the HP niche, V2 Zealios are the only ones readily available that have tactile stems in them. GSUS & YOK come with black linear stems so you’ll need to source other stems for them & MD’s HPs will only be available periodically at best. Even though it seems like there are too many switches trying to fill the same void right now. As it stands these & V2 Zealios will be the only two switches you can just order up pretty much anytime & not need to source additional parts for. I think as long as these are decently smooth & tight they will end up being fairly popular in the community. Totally agree, even in this case, the pre orders for Round 1 have sold through. I’m honestly stoked with the tactility of my V2 Zilents, but will be picking up some KBDFans switches when they’re back in stock. First Holy Panda clone to use a translucent top housing and black bottom housing with a black tactile stem wins for me. Don’t let me down 2019. Yeah these moved pretty quick. If you’re looking for a housing to make HPs, NovelKeys had some YOK Red Pandas (same as GSUS but with a different name on the housing & red colored housing) available on their site yesterday. Not sure if they’ll be sold out or not though. I picked up 100 of them early yesterday & after that the site was showing sold out, but last night they were showing in stock again so I’m not sure where their stock of them is at. Novelkeys will have some soon. I thought so too but saw it available again so ordered some today (couldn’t resist the color). Maybe stock from cancelled orders. Yeah these moved pretty quick. You could say that again! They were sold out when I first saw them on the KBD Fans site, and I window shop there pretty often. I wonder how they compare to HPs without modification? My hope is that they would be good enough to just pop right into a board without modification. If these are anything like KBDFans’ track record, they’ll have subpar stems, great housings, and terrible springs. I doubt they’ll be good enough for stock as-is, but I do hope for some good performance on their individual parts. Yeah, I ordered some of the YOK Red Pandas, but decided to cancel my second order of 60 switches. I’ll probably just keep the other 10 switches for fun, or make some Helly Pandas and put them into a macropad. Get Gazzew’s silent Outemu clear stems and gold springs for max bling?